Twitter and Facebook made the trip to Capitol Hill this week for a grilling by US senators – but it was the company which stayed away which copped most of the flak. On this week’s Tech Tent, we ask whether Google made a huge tactical error in refusing to send one of its leaders to Washington. While Twitter sent its chief executive Jack Dorsey, and chief operating officer Sheryl Sandberg represented Facebook, Google only offered up its top lawyer. The senators wanted more star power in the form of company founder Larry Page or Google chief executive Sundar Pichai – and when they were unavoidably busy, the committee opted for an empty chair instead. Ms Sandberg is an accomplished speaker and once worked in Washington, so the fact that she survived the hearing relatively unscathed was not a surprise. She repeated the now familiar mantra that Facebook had made mistakes in not spotting Russian interference but was now employing hordes of staff to put things right. By contrast, many thought Twitter’s Mr Dorsey – who described himself to the committee as “someone of few words and typically pretty shy” – would struggle to deal with the politicians’ questions. In the event, his low droning voice seemed to lull them into submission, although he was forced to admit in a later hearing before another congressional committee that Twitter’s algorithms had not always been impartial, reducing the visibility of 600,000 accounts for no clear reason. But time and again, the senators chose to thank the Twitter and Facebook executives for turning up and bemoaned the absence of Google. After the Intelligence Committee’s hearing, our man Dave Lee spoke to the leading Democratic Senator Mark Warner, who was quick to attack Google. “I would hope after Americans saw that empty chair, that somebody in Google’s management or somebody on their board would come to their senses and say, ‘hey we need to answer American policymakers’ questions’,” he said. 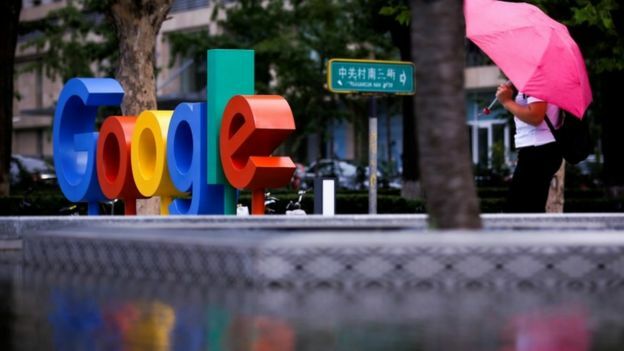 Among those questions would be just what Google was playing at in China, where it is apparently exploring providing a search engine that would comply with the Chinese authorities’ censorship demands. Perhaps the firm’s senior executives decided that the danger of being trapped into saying something that might come back to bite them was just too high. But they may have misjudged. Immediately after the Senate hearing, the US Department of Justice announced an inquiry into the activities of the social media firms. It said Attorney General Jeff Sessions, who may be keen to find an issue on which he can agree with President Donald Trump, was convening a meeting to “discuss a growing concern that these companies may be hurting competition and intentionally stifling the free exchange of ideas on their platforms”. Also on this week’s Tech Tent we meet the women trying to show that female tech entrepreneurs can thrive in Berlin. And actor or algorithm – is a computer-generated Donald Trump more convincing than a human impersonator? Listen in and find out. Previous Article British Airways violations: How did hackers enter?